Thinking about taking a Christmas cruise next year. For those of you that have taken one, how was your experience? I have never taken a Christmas or other holiday cruise, but I have never heard any serious complaints about them. Most have really enjoyed the extra decorations and atmosphere. 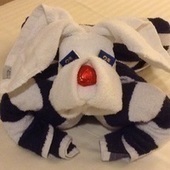 I have done the week before X-mass, it is great, the ship is decorated, it is not fully booked (people are to busy getting ready for X-mass to cruise) and the price is good. I have cruised during Thanksgiving, we were in Europe. Celebrity had the traditional Thanksgiving dinner as one of the choices in the MDR that was very good. Just finished one a week before. Debarked on Dec 22. It was awesome. One of these years I too would like to try a Christmas one. We have not actually sailed on Christmas.because we figured there would be lots of children... so we go 2-3 weeks before. Same as Aunt Pinkie for me. We sailed Carnival in early December and the decorations were beautiful - there were so many Christmas trees around the ship. Never sailed on the actual holiday, though. I've never done a cruise over Christmas but usually go the week before. I've always had a great time. Weather is great, water is perfect, and the ship is decorated very festively. It is nice to see how how places celebrate the Christmas holiday. I would like to cruise over Christmas but that is week is always so expensive! I've taken a few Christmas cruises, loved them all! They even had Santa on some of the ships for the kids. I even got to help out the Kids Club one year with a Holiday Concert for the parents! No Xmas cruise here. However, I've boarded the day after for a NYE cruise had a grest time. What I can tell you about a Xmas cruise is to expect to pay a lot more because Xmas and NYE cruises are the most costly. I have a friend who has taken one with her immediate family. My family is quite small so we are going on one this year, Symphony of the Seas 12/22-29. I hear the decorations and ambiance is absolutely amazing. Everyone is jolly and merry in the holiday/new year spirit. I hope others comment who have had the experience or know someone who has and report their review of the week.